I have suffered through many dry, bland turkey dinners with tasteless gravy. I’m sure you have, too. This turkey recipe from Gordon Ramsay will put an end to your suffering. A couple of years ago, I came across the Gordon Ramsay Christmas special. He featured many recipes for the holidays, including this recipe for roast turkey. I think I wore out the DVR replaying it over and over again while trying to cook Thanksgiving dinner. The results are spectacular! Here is the clip from the Ramsay special (includes the gravy recipe as well). This recipe is really for turkeys that are not brined. There will be plenty of butter over and under the skin. Basting every 30 minutes is also key to a juicy bird. And you’ll save yourself from all that sodium (200mg versus 65mg per serving). Worried about how long to cook your turkey? Check out Epicurious’s chart for roasting time and temperature. 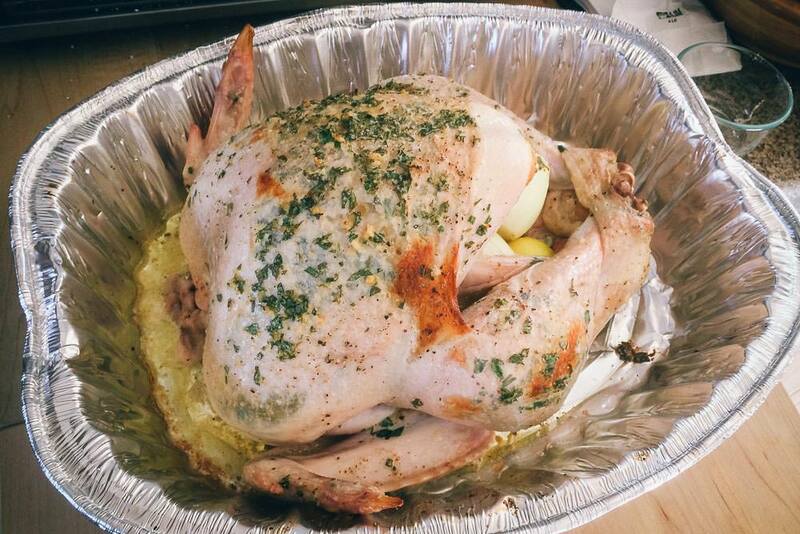 You can prep the bird or just the butter mixture the night before to save time for the following day. The bacon is used instead of aluminum foil to keep the skin from burning on top. The bacon fat will also keep it from drying out. 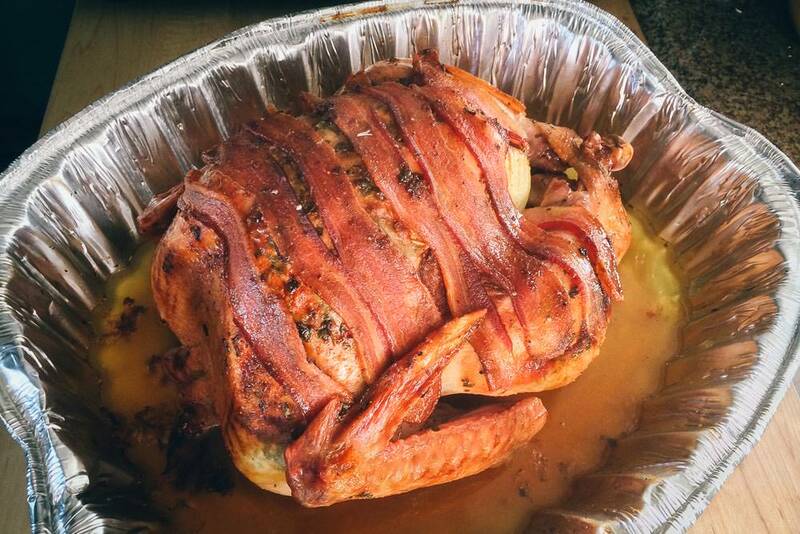 Once the turkey is cooked, you can use the bacon for the gravy (see gravy recipe below). You must let the turkey rest for as long as you cooked it! This will allow the juices to be reabsorbed into the bird. 20 minutes is not enough time. If you cooked it for 3 hours, let it rest for 3 hours. You can warm up the turkey with hot gravy or in the microwave just before serving (heat it covered or it will dry out). Preheat the oven to 220°C/Gas 7/425ºF. Meanwhile, prepare the herb butter. Put the butter into a large bowl and season with salt and pepper. Add the olive oil and mix well. Add the lemon zest and juice, crushed garlic and chopped parsley. Mix well to combine. Remove the giblets from the turkey cavity. Season the cavity well with salt and pepper, then stuff with the onions, lemon, garlic halves and 2 bay leaves. With your hands, loosen the skin on the breast from both ends of the bird so that you will be able to stuff the flavoured butter underneath it, making sure you keep the skin intact. Repeat with the skin on the legs – from the lower side of the breast feel your way under the skin and out towards the leg, loosening the gap. Stuff half the butter mix into the opened spaces under the skin. From the outside of the skin, gently massage the butter around the breasts so that the meat is evenly covered. Finally, insert the rest of the bay leaves under the skin of the breasts. Roast the turkey in the hot oven for 10–15 minutes. Take the tray out of the oven, baste the bird with the pan juices and lay the bacon rashers over the breast to keep it moist. Baste again. Lower the setting to 180°C/Gas 4/350ºF and cook for about 2½ hours (calculating at 30 minutes per kg), basting occasionally. To test whether your turkey is cooked, insert a skewer into the thickest part of the leg and check that the juices are running clear, rather than pink. As oven temperatures and turkey shapes and sizes vary, it is crucial to check your turkey about 30 minutes before the calculated roasting time. If the juices are pink, roast for another 15 minutes and check again. Repeat as necessary until the turkey is cooked. Transfer the turkey to a warmed platter and remove the parson’s nose, wings and tips of the drumsticks; reserve these for the gravy. Leave the turkey to rest in a warm place for at least 45 minutes; make the gravy in the meantime. Remove the bay leaves from under the skin before carving. Serve the turkey with the piping hot gravy, stuffing and accompaniments. 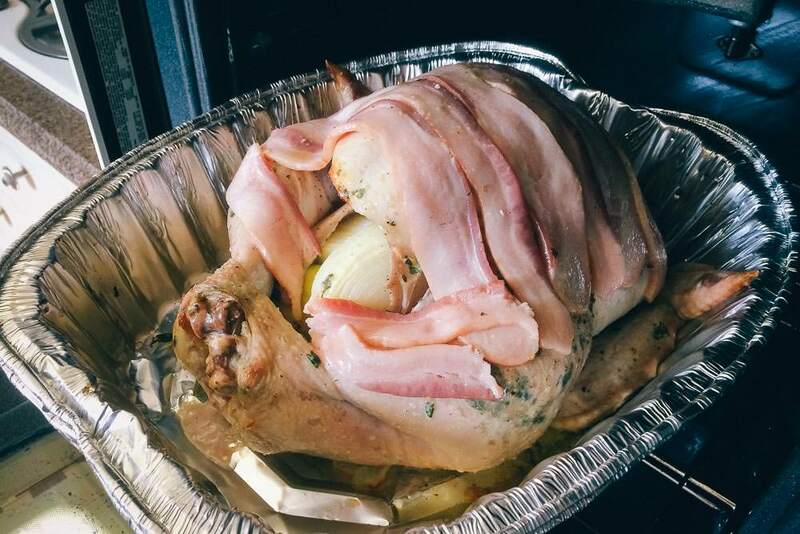 Use bacon to cover the top of the turkey to protect the skin. The bacon fat will help keep it from drying out. The final result – a delicious turkey! Once you’ve transferred the cooked turkey to a platter to rest, drain off most of the fat from the roasting tray and place on the hob. Roughly chop the bacon, add to the tray and fry for a few minutes. Chop the onions and lemon and add to the tray with 2 rosemary sprigs and the tomatoes. Cook for 1–2 minutes, then add the turkey wings, parson’s nose and drumstick tips and fry for a few more minutes. Pour in the cider and boil for a few minutes. Add the juices from the resting turkey and simmer to reduce the liquid by half. Pour in the stock, return to the boil, then reduce the heat slightly. Using a potato masher, crush the vegetables in the tray. Simmer for 15–20 minutes, stirring occasionally, until reduced again by a third. Take off the heat. Strain the gravy through a sieve into a saucepan, pressing down on the solids in the sieve with a ladle to extract as much of the flavourful juice as possible. Add a fresh sprig of rosemary to the pan, then turn off the heat and leave to infuse for a few minutes. Before serving, remove the rosemary, season to taste and reheat the gravy. Coarsely crush the walnut pieces using a pestle and mortar and then tip into a warmed gravy jug. Pour the piping hot gravy on top and serve at once.